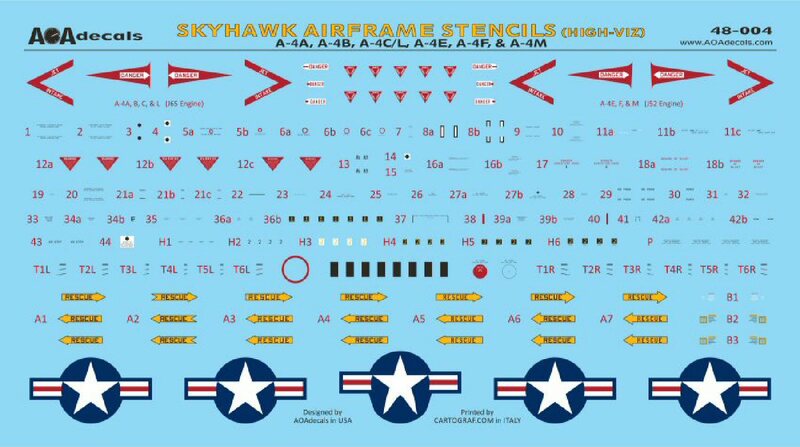 This third sheet by AOA Decals for the A-4 Skyhawk includes markings for twelve Vietnam era aircraft. 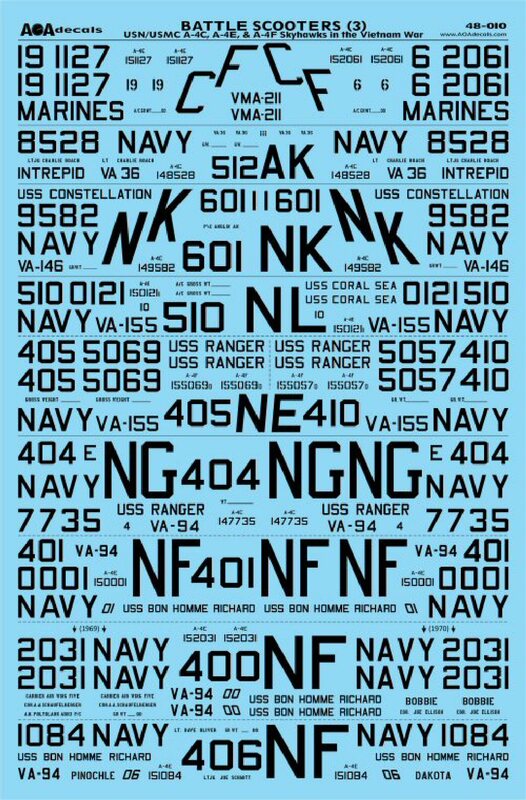 This sheet is mostly Navy aircraft but there are two Marine aircraft. The instructions are typical of AOA Decals being stored in a large ziplock bag with four double-sided 8.5x11 pages. Each aircraft is described in detail. The specific updates to the models are included on the first page. This addresses the correct antennas and the things needed to do the model properly. All the aircraft are Light Gull Grey over White but that is the only thing plain about them. They display full color markings from the front to the rear of each aircraft. The last page of the instructions covers the stencil location for both types. The decal themselves are printed by Cartograf so you know they are some of the best in the world. They are thin and in register. The colors look perfect. They will react well with all the setting solutions I've ever used on them. The decals are on three separate sheets. The first one is 6 1/4 x 10 1/2 inch in full color with all the squadron markings. The second one contains all the black markings on a 5 3/4 x 8.5 inch. 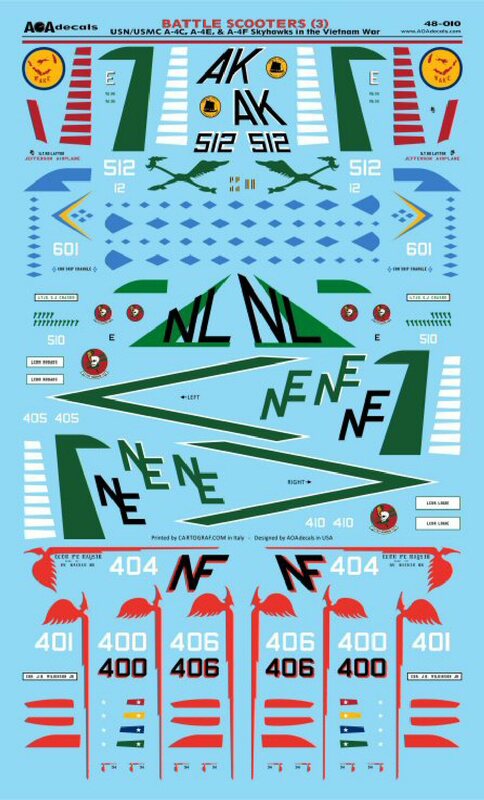 The third sheet is actually AOA Decals 48-004, A-4 Stencils. They are on a separate 8 1/2 x 4 1/2 inch stencils. They are also available separately if you want to build more than one of these aircraft. The two Marines are from VMA-211, the Wake Island Avengers at Chu Li in 1968-69. One aircraft from the Blue Diamonds of VA-146 aboard the USS Constellation in 1964-65. One aircraft from VA-36, the Road Runners, is included from the Intrepid in 1968-69. VA-155, the Silver Foxes, are on three aircraft from the USS Coral Sea and USS Ranger. The final five aircraft are from the Mighty Shrikes of VA-94 aboard the USS Bon Homme Richard. The Navy and Marines have always had some colorful aircraft and these twelve aircraft are indicative of that flair. The printing by Cartograf and the thorough research by AOA Decals makes this a winning decal sheet. Another great product from AOA Decals. Thanks to AOA Decals and IPMS/USA for the review copy. You can obtain your copy by contacting them at AOAdecals.com. Make sure you let them know that IPMS/USA sent you.